The path that leads to the center of the Circle of Peace is the path that people must traverse to reach themselves. The inner peace of people determines the external peace in the world. 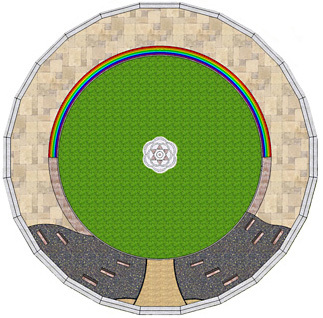 The Circle of Peace shows the Tree of Life, which breaks through a dark ring of 11 commemorative stones as “projection surfaces”. This dark ring symbolizes the vicious cycle of suffering and violence. It is surrounded by the Threshold of Humility, which bears the inscription: “Recognize the Holy in your midst”. This recognition would have prevented the Shoah. If it were recognized today, Germans would not hate their own culture, which is nothing else then a negatively transformed cultural arrogance and which can allow the past to repeat itself – even with all the struggles against this past in retrospect. Our country often seems to focus heavily on the negative. This can even lead to self-hatred and a rejection of one’s own identity. A society cannot progress if it falls back on the negative to try and develop. It is important to have a motivation, an engagement for life surrounded by love and reason. We need to believe in something good in people to allow it to express itself. Resentment, dissatisfaction, and anger can be detrimental to people, but they can also be transformed into a creative expression for life – the Turning Point inside the Circle of Peace – into awakening, courage, and a zest for life. Recognize the potential for good in yourself and others. The hexagram of the Rose of Shalom located at the center of the Tree of Life, is composed of two interlocking triangles. One of them points upwards – from the world to the spirit; the other one points downwards – from the spirit to the world. It is a symbol of the heart, where the upper and lower realms meet. Symbolism has no magical effects, but it helps in understanding. 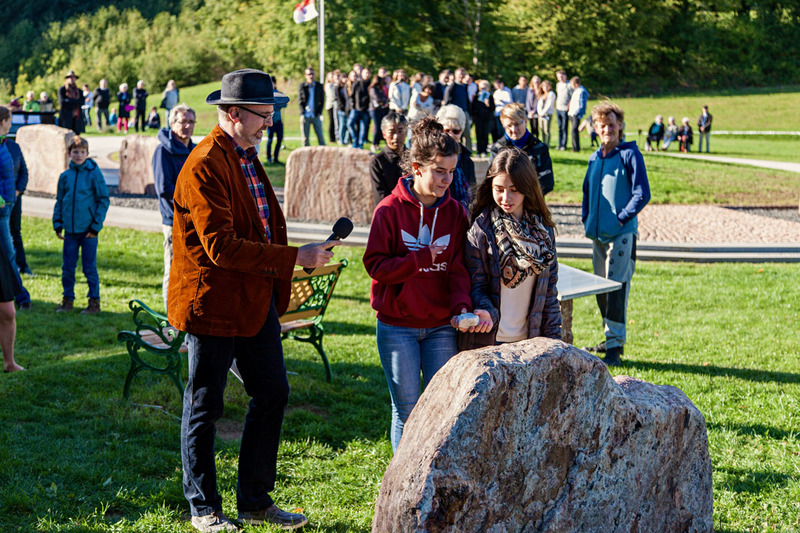 The Circle of Peace contains 11 commemorative stones. The 1 symbolizes the will of the one God. The 0 is the absorbing vessel. The 10 also represents God’s creation, which is subject to His will. The 11 adds another will: my own will – being one of God’s creatures (10) – fallen out of the order of the 10. The 11 symbolizes the task to bring one’s one will into line with God’s will again. Thus, every stone in the Circle of Peace represents the transformation of suffering, of a burden into a blessing. This means that I want to bring something inside me – in my thinking, feeling, and acting – in line with God’s will again. This is referred to as Tikkun in Jewish Kabbalah. The Tree of Life is one of the main religious symbols of the entire Indo-Germanic culture. The symbol probably arrived in our cultural region from Indonesia, via the Indian Vedic culture. 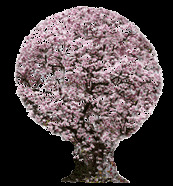 In Judaism, the Torah – instructions of God – are “a Tree of Life”. For Christians, Jesus Christ is the Tree of Life: “I am the Way, the Truth, and the Life; no man comes to the Father, but by me!” (Joh. 14,6). Comment: As I interpret the Bible, this means that someone should become a “Child of God”, to connect as a son or daughter of God "earth and heaven"; like a tree does. The Tree of Life shows a simplified representation of the crown and trunk of a tree. The roots are located in the dark of the earth, and the branches extend towards the sky. The Tree of Life stands for the inner journey of humans as “Children of God”, connecting the earth with the heaven, the material with the spirit; it’s a journey of love towards becoming heavenly people. It is the inner journey of humans towards themselves – a journey of grace and healing. The Tree of Life – or rather: the upper roots and lower trunk – breaks through the dark space. It is the root of the tree that draws up the water from the dark earth and brings up the humus, the earth's soil to be turned into growth, blossoms, and fruit when combined with the air in the leaves.